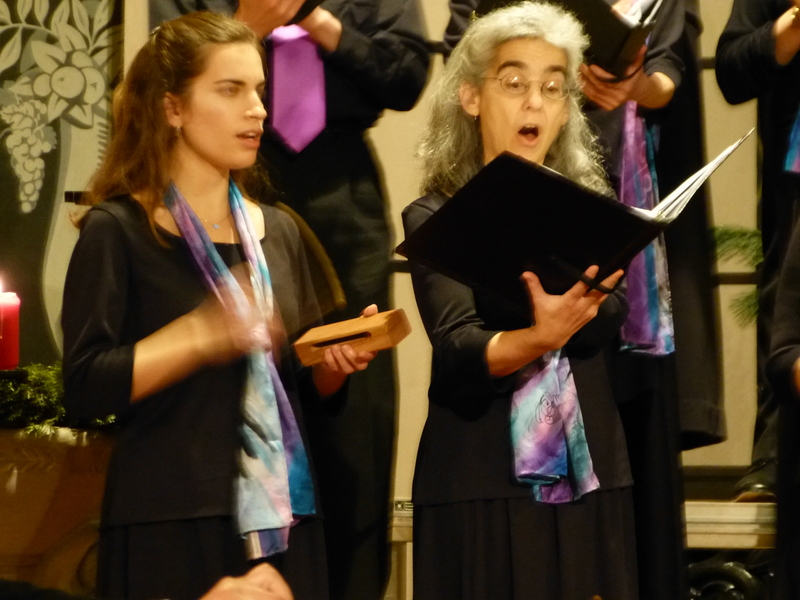 Judy and her husband Mark were guests of the Zamir Chorale of Boston at the Lewandowski Festival — from Australia! We were honored to have Judy and Mark in the ranks of our choir during our tour. Berlin …. A wonderful city for Jews. Who would have thought? Attending the rededication of the magnificent Pestalozzistrasse Synagogue, reopening after restoration to its state prior to Kristallnacht, one could not fail to be moved. The interior was destroyed in November 1938, though the building remained standing. It reopened in 1947 as best it could and continued thus, until the recent restoration to its former glory. The synagogue is home to a liberal community that is an interesting mixture of traditions. Male and female seating is separate, there is a grand organ used throughout the service, and prayer is supported by a cantor and first rate mixed choir. The revered German Jewish composer, Louis Lewandowski, composed most of the musical settings used in services here. The rededication event included the official opening of the 2014 Louis Lewandowski Festival. The inaugural festival took place three years ago and it is now presented each December in Berlin. It is a prestigious international choral festival, with just 6 Jewish choirs being invited to Berlin to participate in 2014. 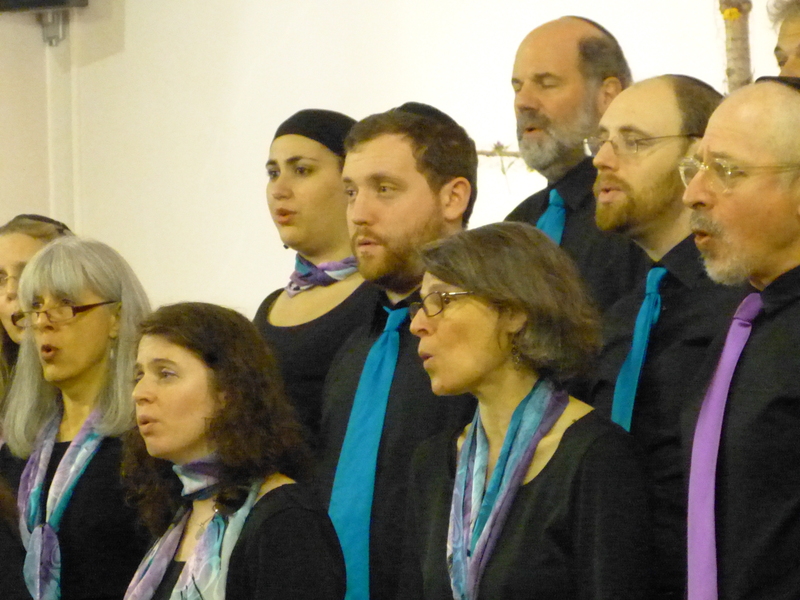 This festival saw two choirs from Israel and one each from Rome, Strasbourg, London and Boston. As director of the Australian Jewish Choral Festival, I was honoured to be invited, with my husband Mark Ginsburg, by conductor Professor Joshua Jacobson to sing with the Boston Zamir Chorale at the festival. The festival and the synagogue have obvious shared interests, resulting in close ties and the natural combining of the festival opening ceremony with the moving rededication of the synagogue. The Lewandowski Festival was thrilling – the concerts, the enthusiastic audiences, the channelling of composers no longer with us, the knowledge that we were helping to revive Jewish life in Germany based on the great cultural achievements of 19th century masters and 20th century greats from the Weimar period. The 2014 festival had an interesting focus: German Jewish composers who fled Nazi Germany and subsequently became famous in the United States. These included Kurt Weill, Heinrich Schallit, Arnold Schoenberg, Stephan Wolpe, Herbert Fromm, Hugo Adler, Samuel Adler and others. Some of these composers were closely connected to the legacy of Lewandowski and continued to model their work on his choral style; others, however, consciously sought to depart from it, finding new musical expressions in synagogue music that catered to the tastes of American Jewish culture. The participating choirs performed music composed by many of these illustrious gentlemen, including several items in German. At the festival, Joshua Jacobson delivered a fantastic lecture about some of these composers, their tumultuous experiences in Germany in the 1930’s and their flight to America. We had the honour of the presence at the festival of Professor Samuel Adler himself, age 87, though you’d never think it. He delivered a fascinating lecture about his life, his famous father, Cantor Hugo Chaim Adler, and their harrowing escape from Germany in 1938. His long and impressive career in America included extensive composition of Jewish music and teaching composition at revered institutions such as the Eastman School of Music and Julliard. Mark and I had the unexpected pleasure of sharing a table one day at breakfast with Professor Adler and his wife, Dr Emily Freeman-Brown, Director of Orchestral Activities at Bowling Green State University, Ohio. Had I ever had any doubts as to the value of preserving the tradition of Jewish choral music, they would have been truly swept away by that lively and inspiring conversation over boiled eggs and hash browns. Interestingly, the director of the Lewandowski Festival, Nils Busch-Petersen, is not Jewish. He is a Berliner, a businessman, philanthropist, and lover of Jewish choral music. He is also a man on a mission to build bridges and honour the Jewish community. He rallies the support of a staggering array of German organisations and individuals to support the festival, under the auspices of Klaus Wowereit, Governing Mayor of Berlin. Festival events and concerts take place at stunning venues, from St Lukas Church to the gorgeous Rykestrasse Synagogue, where we performed to an appreciative audience of over a thousand people from the Jewish and wider community. We were warmed and delighted by the way in which the Boston Zamir Chorale welcomed us into their choral family for the festival performances, where I must say that this choir stood out as one of very high quality. Equally delightful, and a surprise to us, was the way in which we saw Jewish life and culture welcomed and acknowledged in Berlin. This took several forms, starting with the festival itself, from the incredible warmth of Nils and his team to the chanukiah lit in the hotel foyer each night. In the city in general too, there were amazing things to be seen. Immediately in front of the Brandenburg Gate, near the huge Christmas tree, was an even huger chanukiah. We were there at sunset (about 3:30pm!) the day after the festival ended and heard Voices of Israel, one of the Israeli choirs at the festival, singing Chanukah blessings and songs. We saw a pamphlet for the Maccabi Games to be held in Germany in 2015. We saw what are called “stumbling blocks” on the pavements of the city, including one right next to our hotel. These are small, brass tiles set into the pavers, but slightly raised so that one literally almost stumbles over them. They commemorate the Jews who lived in homes in these locations and were either caused to flee, or were evicted by force and murdered by the Nazis. We visited the Jewish Museum, which outlined the history of Jewish life in Berlin. It was good, as one would expect. In another museum, however, “The Story of Berlin”, starting in the 1200’s, there were surprises. An entire room on religious history contained an excellent presentation of the histories of Christian, Jewish and Muslim history in Berlin. The museum did not focus particularly on the Holocaust, but did not shy away from it either. We met B’naya, a young Israeli composer and his wife Atalia, an aspiring opera singer. They feel there is vast opportunity for them in Germany and love their new life in Berlin. There are differing opinions, but the number of Israelis now living in Germany is estimated to be as high as 20,000. Most are landing in Berlin, the former Nazi capital that is fast emerging as a beacon for young Jews. Nir Ivenizki, a 32-year-old Israeli who recently opened a café-record store in the exceedingly hip Berlin neighbourhood of Neukölln, spoke to the Washington Post, saying “You cannot forget the past, but I’m interested in the present and the future. Germany is now one of the most socially accepting countries in the world”. Our experience in Berlin was a real surprise amid the stream of gloomy news about rising anti-Semitism around Europe. 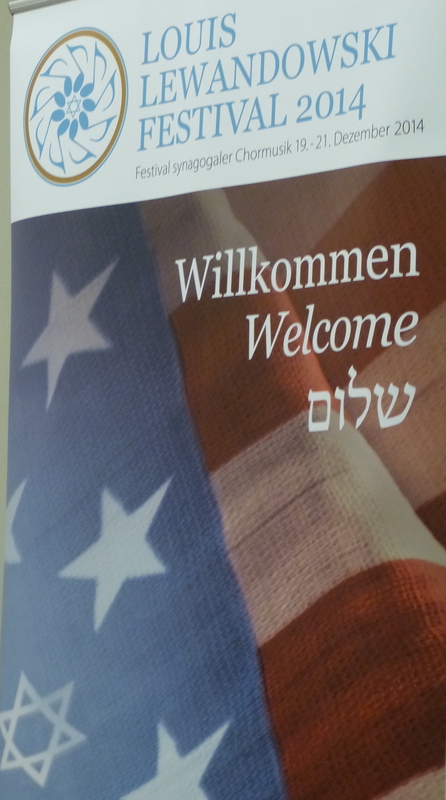 In Germany we felt safe, respected and warmly welcomed as Jews. How ironic. The terrible past is of course unchangeable. But it seems that in Germany, two generations down the track, there are a great many who value the part played by Jews in German society, and are actively demonstrating this in public arenas. A final word on the subject came from Professor Samuel Adler, German Jewish refugee, who, over his boiled eggs, told us that he believes there is nothing to be gained by holding on to vengeful feelings, while there is much to be gained by opening the door to the efforts being made in Germany today. Mark and I will always be grateful to Joshua Jacobson for his invitation and the opportunity to sing with the Zamir Chorale of Boston at this fantastic event. It was fascinating to sing with, and hear Jewish choirs from other parts of the world, and experience a taste of renewed Jewish life in Berlin. 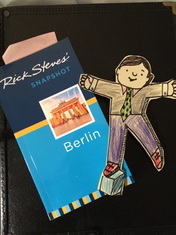 Betty Bauman, our soprano section leader, traveled to Berlin with Flat Stanley in tow. Here is a taste of her Flat Stanley adventure, but to see the whole thing you’ll have to go to this link! My name is Flat Stanley, and I love to travel! Because I’m flat, I usually travel in an envelop through the mail, but this time, I got to travel in Ms. Bauman’s suitcase to Germany. The name of the city we visited is Berlin. Ms. Bauman went to Berlin to sing with her chorus, the Zamir Chorale of Boston, at the Louis Lewandowski Festival. At the festival, there were seven choruses from all over the world. Some of the singers we met were from Italy, France, England, Israel, and Germany. Ms. Bauman’s chorus was the only group from the United States. We were in Germany for five days, and Ms. Bauman was very busy singing in three concerts, so we didn’t have too much time for sightseeing. But don’t worry — we managed to see a few really neat things, and I’m excited to share them with you! Shabbat dinner had ended and I was ready to call it a night, but just outside the dining room, members of the Amakim choir from Israel were gathered in a circle, singing a folk song. I decided to stay and listen for a bit. We Zamirniks had sung during dinner but most choirs hadn’t, so besides wanting to hear another choir’s music, I wanted to repay their attention at dinner. When the song ended, someone began to speak. My Hebrew is pretty basic, and at first I thought the person was talking about the next song. I began to grow impatient. Didn’t they know I had stopped to listen to singing, not speaking? A few minutes later, though, a woman I’d sat with on a bus earlier spoke the words “Bergen-Belsen” and everything shifted for me. These weren’t anecdotes about songs; they were family stories of surviving the Shoah (Holocaust). After every speaker or two, the assembled singers, maybe 25 in all, sang a soulful song in unison. I later learned that these were not the songs they would perform at the festival; they were songs that might be sung after Shabbat dinner at home. Though I didn’t understand much, I listened on. Something profound was taking place, and I wanted to be a witness. I would like to have understood more, but it wasn’t necessary. What mattered was that people were telling their stories and others were listening. I have to confess that the stereotype of Israelis as noisy and impatient is one I have internalized. On this night they were silent, attentive, respectful, and, except for a gentle nudge to one meanderer, content to let each narrative take as long as it needed. I hadn’t meant to stay long (or even sit down), but a man (whose name was Ariel, I later learned) brought me a chair. I admitted to him that I didn’t know much Hebrew. I saw him a couple of days later and asked whether this sharing was something the choir had planned. The answer was no; it had arisen from the unique circumstance of being at a Jewish choral festival in Germany. Eventually my lack of understanding made listening too hard, and I left. A few other Zamirniks who had also been present gathered in the lobby, all of us touched by this remarkable experience. One woman of our group asked whether she might share her own family’s story of survival. Telling us then, and the rest of Zamir a couple of days later, clearly meant a great deal to her. Earlier that day, at the rededication of the Pestalozzistrasse Synagogue, Rabbi Tovia Ben-Chorin had called Berlin a city of wounds and wonders. How touched and privileged I felt to be present as wounds and wonders converged. Josh being interviewed by a local Berlin radio station about the Louis Lewandowski Festival. We came to Berlin not to mourn the Holocaust but to celebrate the rich Jewish culture of pre-War Germany. This was our second time participating in the annual Louis Lewandowski Festival. The festival is now in its fourth year, celebrating the beautiful music of the great nineteenth century composer and music director of the majestic Oranienburgerstrasse synagogue in Berlin. This year’s festival, subtitled, “Stars and Stripes” focused on German composers who emigrated to the United States during the twentieth century. After the Nazi party came to power in 1933 and instituted their policies, many Jewish composers became increasingly aware of their religious and cultural heritage, and expressed it musically. Arnold Schoenberg, Stefan Wolpe and Kurt Weill were among the greatest composers of their time. After leaving Germany, all three devoted much of their energies, emotions and creative output to Jewish subjects. Other prominent refugees, including Herbert Fromm, Heinrich Schalit and Max Janowski, on arriving in America dedicated themselves to the music of the synagogue. These were the composers we highlighted in our performances. The audiences’ reactions could not have been more enthusiastic. We had three formal concerts. We were privileged to open the festival with a performance at St. Lukas Kirche. 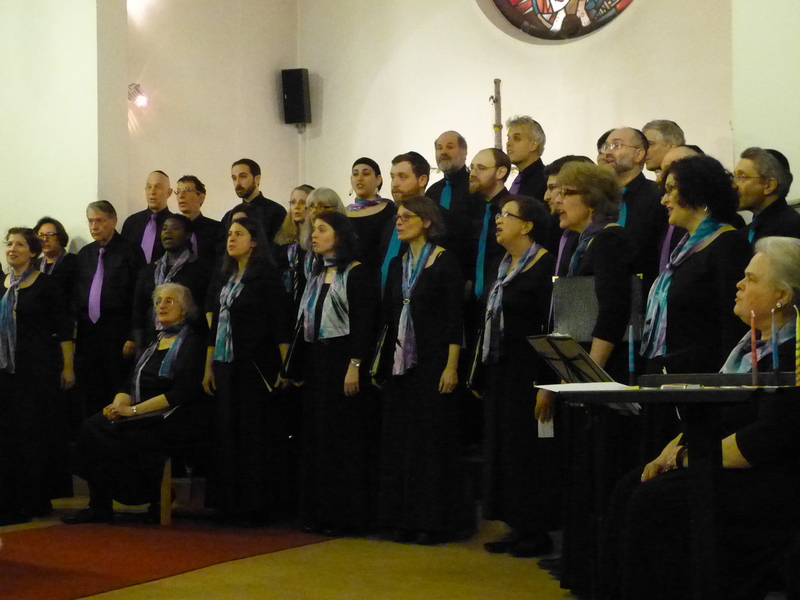 Saturday night we shared a concert with the Amakim Choir from Israel at Pankow’s Evangelische Hoffnungskirche. 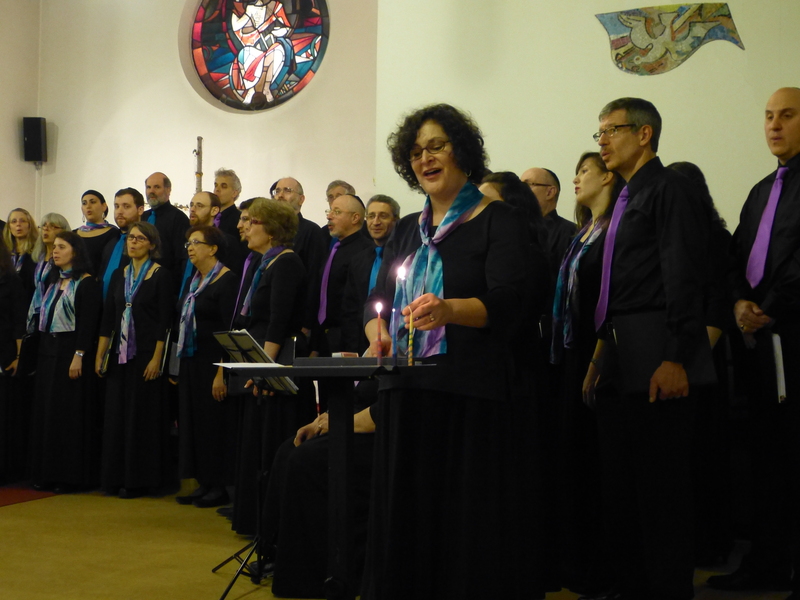 And Sunday’s concert at the Rykestrasse Synagogue featured all seven choirs: Zamir, Amakim, Ensemble Vocal Hébraïca from Strasbourg, the London Jewish Male Choir, Coro Ha-Kol from Rome, the Voices of Israel Ensemble from Netanya, and Berlin’s Synagogue Ensemble. This wasn’t just a concert tour; it was a mission. The Jewish community in Berlin today is growing. But most are recent Israeli or Russian immigrants who know nothing of the great pre-war German-Jewish traditions. And many (perhaps most) of the people in our audiences were non-Jews. So we had great sense of accomplishment in reviving German Jewish culture! At the end of our concerts we sing Rutter’s “The Lord Bless You” while the singers fan out into the audience and get as close as they can to the people in the seats. When the music finishes we make physical contact and shake hands with the members of our audience. It creates such a beautiful connection. Perhaps our first highlight was singing as we lit (electric) Chanukah candles at Logan airport just before boarding our plane. One of the highlights was hearing Prof. Sam Adler talk about the people whose music we were singing. He is the only living remnant of the German Jewish refugee composers—he escaped with his family when he was ten. He’s now 87 years old and extremely vital! He conducted the massed-choir performances at the final concert of the festival. Another highlight was to meet fellow choral singers and conductors from Italy, England, France and Israel—men and women who share our peculiar enthusiasm for singing choral music from Jewish traditions. And it’s interesting to hear how the same piece of music can be interpreted so differently by various ensembles. The sun sets very early in Berlin in December. Friday afternoon we gathered at the Pestalozzistrasse Synagogue for its official reopening and rededication after more than a year of restoration construction. In this moving ceremony the torahs were carried down the aisle and brought back to the ark. Most of the speeches were in German, but it was still impressive to watch, to listen to the musical performances by the choir and cantor, and to be in this beautiful building. After a brief ceremony opening the Festival, the Kabbalat Shabbat services began. This is a “liberal” synagogue: the traditional service is nearly all in Hebrew, the men and women sit separately, there is an organ and an excellent professional choir. The music is (nearly) all compositions by Louis Lewandowski, and we were invited to join the choir in several selections. This seems to be the only synagogue in Berlin that is perpetuating the unique musical traditions of that city. 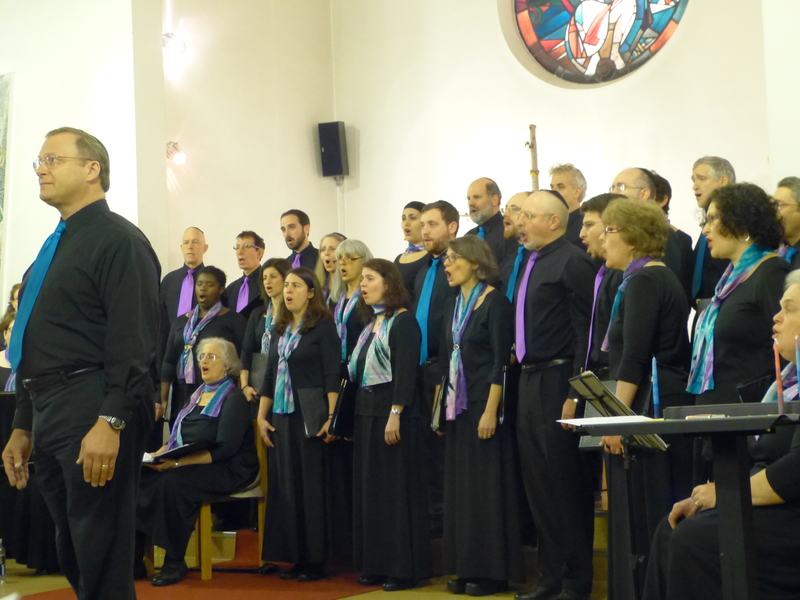 The Zamir Chorale of Boston is the only ensemble to have been invited back for a second appearance at the Festival. We were at the first Festival in 2011 and then returned in 2014. We are also the only ensemble to have represented the United States, and the only ensemble to perform the “pre-opening” festival inauguration concert. This festival is supported by a consortium of non-Jewish businessmen in Berlin. The founder and driving force is Nils Busch-Petersen, a lawyer and politician and chief executive of The Retail Associates of Berlin. Years ago he fell in love with the music of Lewandowski as it is sung each Shabbat at the Pestalozzistrasse Synagogue in Berlin, and was one of the founders of the “Friends and Supporters of the Berlin Synagogue Ensemble.” In 2011 he founded the Lewandowski Festival, which is now in its fourth successful year. While Busch-Petersen is the overall director if the Festival, the musical direction is led by Regina Yantian, with the help of an advisory board that includes Sam Adler, Tina Freuhauf, Avner Itai, Josh Jacobson and Eli Schleifer. The Festival organizers generously provide all accommodations on the ground, including lodging at [our] Hotel in downtown Berlin, lavish kosher catered meals (with plenty of wine and beer), all ground transportation by bus, and all concert arrangements. 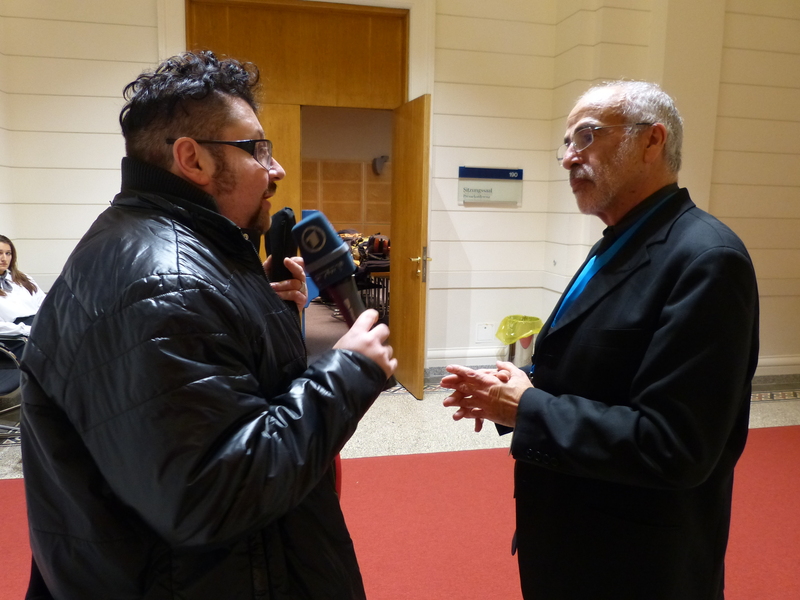 On Saturday night, when we were being hosted at the Berlin Parliament building, I spoke with Carolyn, who works with Nils in producing the Lewandowski Festival. For Devorah – talk about another davka moment. Friday night at the Pestalozzistraße Synagogue in Berlin. Last time we were in Berlin, the Pestalozzistraße synagogue was not run down but it was a seemingly tired building, mostly white walls with hunter green accents. The synagogue had been destroyed on Kristallnacht, 9 November 1938, and had been re-opened in 1949. We had been told that since 2011 when we were last there, the building had been closed for renovations and that this Friday ninght would be the rededication. What an unexpectedly amazing, powerful, emotional experience that was! It was powerful. The feeling of wholeness was palpable. A homecoming, a healing of wounds. Perhaps not without a scar, but not cowering in shame by any means. May God bless this place, this community, to continue to heal and to continue to serve the Jewish community. May they be blessed with growth, with vibrant Jewish life, with more and more opportunities to celebrate joyous occasions and to find with themselves and offer forgiveness. Zamir was privileged to sing a pre-opening concert at the St. Lukas-Kirsche (St. Luke’s Church) in Berlin this evening. The audience was receptive and warm, happy to see us, and so, despite having been barely awake and having traveled 6,000 km, we felt pretty great about our performance. Singing in churches presents a dilemma for us. We sing “in service of God”: many of the pieces we sing are not just music – they are prayer to our God. How do we reconcile this with singing in another’s religious space? This is as much about respecting their beliefs as protecting our own. Furthermore, today, we couldn’t rationalize that it was “decontextualized liturgical singing” if we wanted to — we ritually lit Chanukkah candles for the third night of our holiday during the concert. I don’t speak for anyone except myself. It’s hard to cross boundaries of religious space. Even in a world where we routinely talk about the unity of one monotheistic God under many names — “Adonai,” “Jesus,” “Allah” — the truth is, we do have separate beliefs. Yet the ability to represent ourselves and our message so positively and the gift of the warm welcome we received from the pastor and community at the church in which we performed are what bring us into a more peaceful future. We unveil our rituals, we really do engage in pirsumé nisa (publicizing the miracle) as we respectfully light candles in observance of our holiday with our neighbors. In turn, we recognize the thoughtful way they’ve beautified their space for the holiday they are about to observe. I celebrate that in a world filled with business and existentialism people still find time to stay committed to the rituals, the music, the community that their religion holds sacred, and I celebrate that we live in a world where we can celebrate each other. I thank the Louis Lewandowski Festival for giving us this opportunity.